Human MCF-7 cells have been studied extensively as a model for breast cancer cell growth. Many reports have established that serum-starved MCF-7 cells can be induced to proliferate upon the sole addition of 17β-estradiol (E2). However, the extent of the mitogenic response to E2 varies in different MCF-7 strains and may even be absent. In this study we compared the E2-sensitivity of three MCF-7 laboratory strains. The MCF-7S line is non-responsive to E2, the MCF-7 ATCC has an intermediate response to E2, while the MCF-7 NKI is highly E2-sensitive, although the levels and activities of the estrogen receptor (ER) are not significantly different. Both suramin and IGF type I receptor blocking antibodies are able to inhibit the mitogenic response to E2-treatment in MCF-7 ATCC and MCF-7 NKI cells. From this we conclude that E2-induced proliferation is dependent on IGF type I receptor activation in all three MCF-7 strains. The results presented in this article suggest that E2-responsiveness of MCF-7 cells is dependent on the secretion of an autocrine factor activating the IGF-IR. All three strains of MCF-7 breast cancer cells investigated do not respond to E2 if the IGF-RI-pathway is blocked. Generally, breast cancer therapy is targeted at inhibiting estrogen action. This study suggests that inhibition of IGF-action in combination with anti-estrogen-treatment may provide a more effective way in treatment or even prevention of breast cancer. Clinical studies have shown that therapeutic agents preventing the synthesis and actions of estrogens are highly successful in the treatment of breast cancer. The mechanisms by which estrogens stimulate cell proliferation, however, are still not clear. The epithelial breast cancer derived MCF-7 cell line is one of the most frequently used model systems. Many groups have reported that addition of E2 to the medium of these cells induces a proliferative response [1–5]. However, a comparison of different laboratory strains of MCF-7 reveals that the degree of stimulation differs, and may even be absent [6–9]. Recently, we have demonstrated that E2 does not induce cell proliferation in the MCF-7S cell line under serum-free, steroid hormone-free conditions. However, E2 in synergism with submitogenic concentrations of insulin-like growth factor I (IGF-I; 2 ng/ml) does induce a proliferative response, comparable to the response to mitogenic amounts of IGF-I (20 ng/ml) . We have found that both E2 and mitogenic amounts of IGF-I strongly induce cyclin D1 expression, whereas submitogenic amounts of IGF-I do not significantly elevate cyclin D1 levels. IGF-I, but not E2, is able to activate PI3-kinase, which leads to inhibition of GSK3β activity. Here, a per se non-mitogenic amount of IGF-I suffices. Inhibition of GSK3β triggers nuclear accumulation of the cyclin D1, but only if cyclin D1 levels are strongly induced concomitantly, which is effectuated by E2. After cyclin D1 accumulates in the nucleus, activation of the cyclin D1/CDK4 complex and subsequent cell cycle progression is observed . In contrast to other laboratory MCF-7 strains, MCF-7S cells are almost completely growth arrested in G0/G1 phase of the cell cycle by serum deprivation in estrogen-free medium, without the need for estrogen antagonists or other inhibitors to reach quiescence. Other laboratory strains of MCF-7 proliferate well when E2 is added after serum-deprivation. In the present study, we compare three distinct MCF-7 strains to determine the cause of their differences in sensitivity for E2. 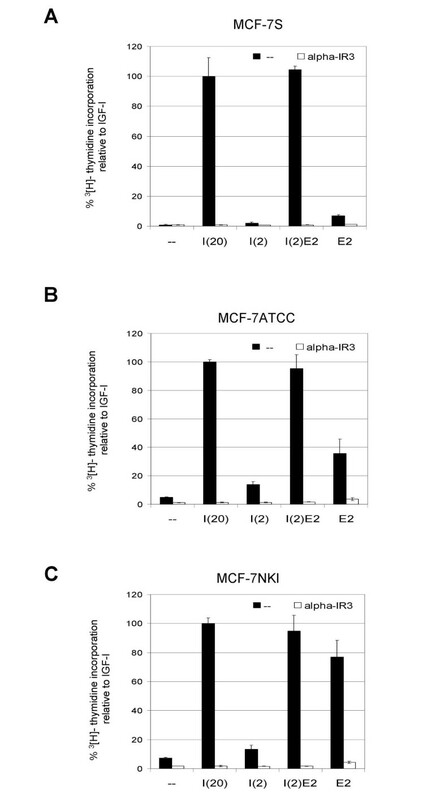 The MCF-7S cell line is non-responsive to E2. The MCF-7 cell line from the American Type Culture Collection (referred to as "MCF-7 ATCC") shows an intermediate E2-response. The MCF-7 line obtained from the Dutch Cancer Institute in Amsterdam, The Netherlands (referred to as "MCF-7 NKI") is highly E2-responsive. The E2-responsiveness of the three MCF-7 strains was measured and compared to their response to IGF-I in a DNA-synthesis assay. The cells were seeded in 24-well plates in steroid- and serum-free medium. After 26 h, 1 nM E2, 20 ng/ml of IGF-I (I(20)), 2 ng/ml of IGF-I (I(2)) or the combination of 1 nM E2 and 2 ng/ml of IGF-I (I(2)E2) were added. Twenty-four h later, 3H-thymidine (3H-TdR) was added for a 6 h period, after which the cells were harvested. Figure 1 shows the 3H-TdR incorporation in the MCF-7 cell lines, normalized to 3H-TdR incorporation induced by 20 ng/ml of IGF-I. A small amount of 3H-TdR is incorporated in untreated serum-starved MCF-7S cells, approximately 1% of the incorporation induced by 20 ng/ml of IGF-I. The MCF-7 ATCC and the MCF-7 NKI cells show higher 3H-TdR incorporation values in untreated serum-starved cells, 6 and 12% of the 20 ng/ml IGF-I value, respectively. This indicates that these cells are less well synchronized by serum- and steroid-deprivation and may need additional treatment to reach quiescence. In MCF-7S cells, only a moderate increase in 3H-TdR incorporation is induced by stimulation with either 2 ng/ml of IGF-I or 1 nM E2 in MCF-7S cells, to 3 and 9% of the IGF-I (20 ng/ml) value respectively. When both IGF-I (2 ng/ml) and E2 are added, a strong increase in 3H-TdR incorporation is observed to 88% of the incorporation level of 20 ng/ml of IGF-I. Thus, a clear synergism of E2 and IGF-I on the induction of DNA-synthesis in MCF-7S cells is demonstrated. In MCF-7 ATCC cells, the 3H-TdR incorporation induced by 2 ng/ml of IGF-I is much higher (26% of the incorporation seen with 20 ng/ml of IGF-I) than in MCF-7S cells. Also 1 nM E2 induces a much larger increase in incorporation (40%) when compared to the incorporation in MCF-7S cells. However, the combination of the two still is synergistic, resulting in a higher incorporation level (115%) than the added effect of the two hormones individually (66%). In MCF-7 NKI cells, E2 is an even stronger inducer of 3H-TdR incorporation. In this MCF-7 strain, addition of E2 results in a higher incorporation level than observed with mitogenic amounts of IGF-I. No synergy between IGF-I and E2 can be observed in MCF-7 NKI, since 3H-TdR incorporation induced by 1 nM E2 by itself is as high as by the combination of IGF-I (2 ng/ml) and 1 nM E2. Effect of IGF-I and E2 on the induction of DNA-synthesis in the MCF-7 strains. Serum-starved cells grown in 24-wells plates were given no mitogens (-), 20 ng/ml of IGF-I (I(20)), 2 ng/ml of IGF-I (I(2)), 2 ng/ml of IGF-I in combination with 1 nM E2 (I(2)E2), or 1 nM E2 (E2) and were harvested after 30 h. 3H-thymidine (2 μCi/ml) was added to the culture 6 h before harvesting. Indicated values are means of triplicate measurements, and were normalized for the incorporation induced by 20 ng/ml of IGF-I (100%). To investigate whether MCF-7 ATCC and MCF-7 NKI express higher levels of ERα than MCF-7S, we analyzed the ERα content of serum-starved MCF-7S, MCF-7 ATCC, and MCF-7 NKI cells by Western blotting. 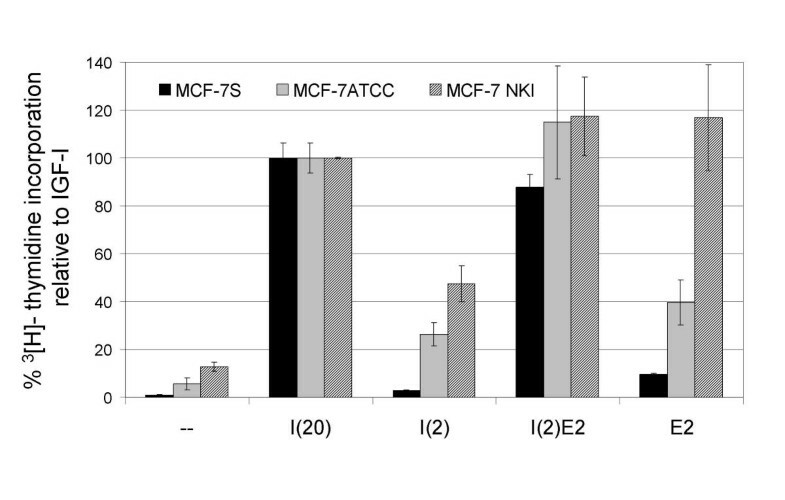 We find that the level of ERα expression in MCF-7S and MCF-7 NKI are comparable, whereas the MCF-7 ATCC express slightly higher levels of ERα (figure 2A). The observed difference in expression levels does not correlate with E2 inducible proliferation in the three strains of MCF-7. A Expression of ERα in MCF-7S, MCF-7 ATCC, and MCF-7 NKI. Serum-starved MCF-7S cells were grown in 6-wells plates, and were lysed. Levels of ERα were analyzed by Western blotting. 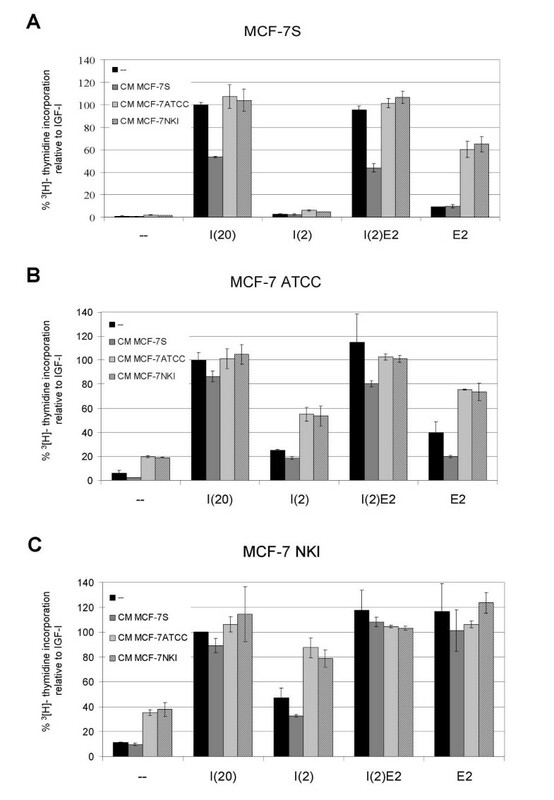 B Induction of cyclin D1 gene expression in MCF-7S, MCF-7 ATCC, and MCF-7 NKI by E2. Serum-starved MCF-7S cells were grown in 6-wells plates, and were given no mitogens (-), or 1 nM E2 (E2). The cells were lysed after 6 h. Levels of cyclin D1 were analyzed by Western blotting. In order to detect differences in functionality of the ER, we analyzed the expression level of an E2-responsive gene, cyclin D1, in untreated serum-starved and in E2-treated cells. Like in MCF-7S cells, E2 treatment induces a strong increase in cyclin D1 levels in both MCF-7 ATCC and MCF-7 NKI cells. No significant differences in cyclin D1 induction were observed in the three MCF-7 strains (figure 2B). Taken together, these results indicate that the differences in growth response upon E2 treatment of the MCF-7 strains are not caused by their ER expression level or functionality. To investigate whether E2 can induce cell cycle progression in MCF-7 ATCC and NKI cells without subsequent activation of the IGF type I receptor, a DNA synthesis assay was performed in which 200 μg/ml suramin was added to the cells one hour prior to stimulation with IGF-I, E2 or the combination of both hormones. Suramin is an anti-tumor agent inhibiting the proliferation of a variety of human cancer cell lines cultured in vitro [12–15]. Suramin acts extracellularly by interfering with the binding of growth factors to their receptors , including several which are known to be involved in tumor growth or development, like IGF-I , and TGFβ . We find that IGF-I-induced incorporation of 3H-TdR is completely inhibited in all three MCF-7 cell lines, when the cells are preincubated with suramin (figure 3). Surprisingly, preincubation with suramin also completely abolishes E2-induced DNA synthesis in all three MCF-7 laboratory strains. These results suggest that activation of a suramin-sensitive receptor is essential for E2-induced cell cycle progression. Effect of suramin on the induction of DNA-synthesis by IGF-I and E2 in the three MCF-7 strains. Serum-starved cells were grown in 24-wells plates, and were preincubated for 1 hour with 200 μg/ml suramin before stimulation with mitogens. Cells were given no mitogens (-), 20 ng/ml of IGF-I (I(20)), 2 ng/ml of IGF-I (I(2)), 2 ng/ml of IGF-I in combination with 1 nM E2 (I(2)E2), or 1 nM E2 (E2) and were harvested after 30 h. 3H-thymidine (2 μCi/ml) was added to the culture 6 h before harvesting. Indicated values are means of triplicate measurements. The values were normalized for the incorporation induced by 20 ng/ml of IGF-I (100%). To test whether E2-responsiveness is dependent on IGF-signaling, the IGF-RI was blocked by the addition of 1 μg/ml αIR3 antibody to the culture medium, which prevents binding of IGF-I and -II to the receptor. Figure 4 shows that IGF-I-induced 3H-TdR incorporation is completely inhibited in all three strains of MCF-7 treated with αIR3. However, also the effect of E2 on 3H-TdR incorporation is reduced to levels comparable to the incorporation in untreated serum-starved cells. This shows that all three MCF-7 strains loose their E2-responsiveness when IGF-RI signaling is blocked. Effect of an IGF-RI blocking antibody on the induction of DNA-synthesis by IGF-I and E2 in the three MCF-7 strains. Serum-starved cells were grown in 24-wells plates, and were preincubated for 1 hour with 1 μg/ml of αIR3 antibody before stimulation with mitogens. Cells were treated with no mitogens (-), 20 ng/ml of IGF-I (I(20)), 2 ng/ml of IGF-I (I(2)), 2 ng/ml of IGF-I in combination with 1 nM E2 (I(2)E2), or 1 nM E2 (E2) and were harvested after 30 h. 3H-thymidine (2 μCi/ml) was added to the culture 6 h before harvesting. Indicated values are means of triplicate measurements. The values were normalized for the incorporation induced by 20 ng/ml of IGF-I (100%). The observed inhibition of DNA synthesis theoretically might be due to toxicity of the antibodies added to the cells. To exclude this possibility, the specificity of inhibition was examined by determining whether other signaling pathways are still intact in antibody treated cells. To this end, the TPA-induced synthesis of the CKI p21cip1/waf1 protein was studied on Western blot. TPA induces the synthesis of p21cip1/waf1 via activation of the ERK pathway independent of IGF-RI . A moderate elevation of p21cip1/waf1 levels is also observed when MCF-7 cells are treated with mitogenic amounts of IGF-I . 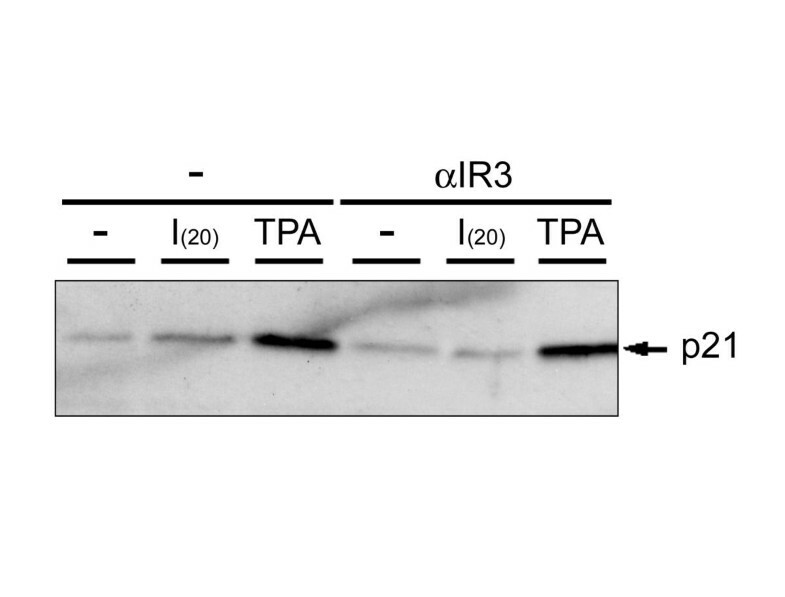 Figure 5 shows that the addition of 100 ng/ml of TPA to the medium induces expression of p21cip1/waf1. IGF-I (20 ng/ml) also clearly results in higher p21cip1/waf1 levels. αIR3 is able to totally block the upregulation of p21cip1/waf1 induced by IGF-I, but does not inhibit the stimulation of p21cip1/waf1 expression by TPA. These results show that the inhibition of E2-induced DNA synthesis in E2-responsive MCF-7 cells by αIR3 is a result of specific inhibition of IGF-RI signaling. Effect of an IGF-RI blocking antibody on the induction of p21 Cip1/Waf1 Serum-starved MCF-7S cells were grown in 6-wells plates, and were preincubated for 1 hour with 1 μg/ml of αIR3 antibody before stimulation with mitogens. They were given no mitogens (-), 20 ng/ml of IGF-I (I(20)), or 100 ng/ml of TPA (TPA) and were lysed after 4 h. Levels of p21Cip1/Waf1 were analyzed by Western blotting. In view of the fact that activation of the IGF-RI is important for E2-induced cell cycle progression in MCF-7 ATCC and MCF-7 NKI cells, we investigated the possibility of autocrine stimulation of the IGF-RI in these MCF-7 strains. To this end, we studied the effect of conditioned media on the E2-responsiveness of the MCF-7 strains in a DNA-synthesis assay. MCF-7S, ATCC and NKI cells were seeded in 162 cm2 culture flasks and incubated in serum-free, estrogen-free medium for two days, after which the conditioned media were collected. For the DNA-synthesis assay, MCF-7S, MCF-7 ATCC and MCF-7 NKI cells were seeded in 24 wells plates, and serum-starved for 24 h. Prior to stimulation the serum-free medium on the three MCF-7 strains was replaced by the conditioned media, or by fresh serum-free medium as a control. After 15 minutes, no mitogens, IGF-I (2 or 20 ng/ml), 1 nM E2 or the combination of 1 nM E2 and 2 ng/ml IGF-I were added to the media. 24 h later, 3H-TdR was added for a 6 h period, after which the cells were harvested. 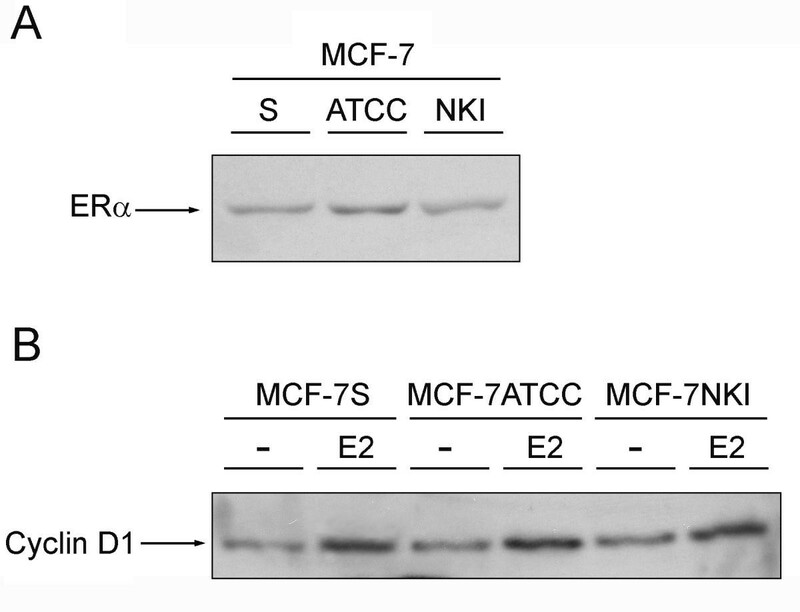 Figure 6 shows the effect of the conditioned media on the MCF-7S cells. In untreated steroid- and serum-free medium, MCF-7S cells are not triggered to progress through the cell cycle by addition of E2. Culturing the cells in conditioned medium from the MCF-7S cell line has no significant effect on the 3H-TdR incorporation induced by any of the hormone treatments. However, when E2 is administered together with conditioned medium from MCF-7 ATCC or MCF-7 NKI, the cells progress through S-phase as is demonstrated by elevated incorporation of 3H-TdR in these cells. Effect of conditioned serum-free media from MCF-7 cells on the induction of DNA-synthesis by IGF-I and E2 in the three MCF-7 strains. Conditioned media (CM) were generated by incubating MCF-7S, ATCC and NKI cells in serum-free, estrogen-free medium for two days, after which the medium was collected and centrifuged to spin down the cell debris. Serum-starved cells were grown in 24-wells plates, and were incubated in normal serum-free medium (indicated as [-] in the figure legend) or in the conditioned serum-free media (indicated as CM MCF-7S, CM MCF-7ATCC, or CM MCF-7 NKI). The cells were given no mitogens (-), 20 ng/ml of IGF-I (I(20)), 2 ng/ml of IGF-I (I(2)), 2 ng/ml of IGF-I in combination with 1 nM E2 (I(2)E2), or 1 nM E2 (E2) and were harvested after 30 h. 3H-thymidine (2 μCi/ml) was added to the culture 6 h before harvesting. Indicated values are means of triplicate measurements. The values were normalized for the incorporation induced by 20 ng/ml of IGF-I (100%). Also in the MCF-7 ATCC cell line, the conditioned media from MCF-7 ATCC and MCF-7 NKI, but not the conditioned medium of MCF-7S, induce additional 3H-TdR incorporation in cells treated with E2 when compared to cells incubated in fresh serum-free medium with E2. In MCF-7 ATCC, incubation in the conditioned media from the two E2-inducible cell lines leads to a higher incorporation in untreated and in IGF-I (2 ng/ml) treated cells. This increase is less pronounced in the MCF-7S cell line (figure 6). In MCF-7 NKI cells, the conditioned media have no significant effect on the amount of incorporation induced by E2, but they do stimulate 3H-TdR incorporation in untreated and in IGF-I (2 ng/ml) stimulated cells (figure 6). These results suggest that the MCF-7 ATCC and MCF-7 NKI cells secrete a factor into the medium that activates the IGF-RI and synergizes with E2 to induce cell cycle progression in all three strains of MCF-7. 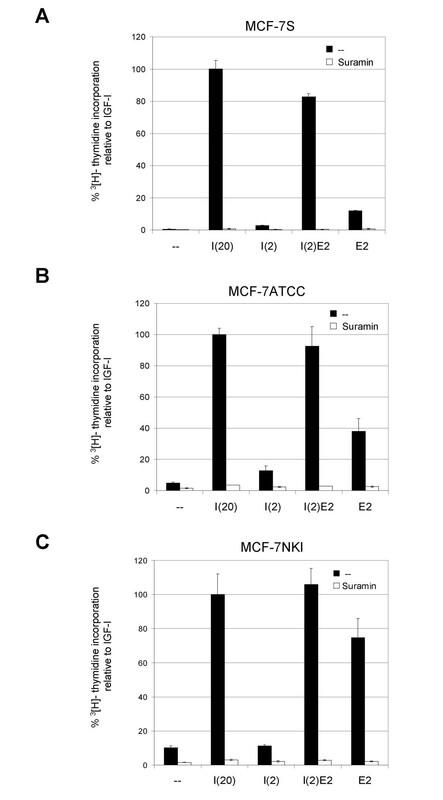 MCF-7S cells do not proliferate upon addition of only E2 (1 nM) to serum-free medium. Other strains of MCF-7, here indicated as MCF-7 ATCC and MCF-7 NKI, which were tested under identical conditions as MCF-7S, do respond to E2-treatment. We have shown that that the observed differences in growth response upon E2-treatment of the MCF-7 strains are not caused by differences in ER expression level or functionality. The effect of E2 on the incorporation of 3H-TdR is completely inhibited by suramin-preincubation in all three cell lines to levels lower than background incorporation in untreated cells. More specifically, we have shown that the induction of DNA-synthesis by E2 in all three cell lines could be blocked completely by incubating the cells with 1 μg/ml of αIR3 antibody, which binds to the IGF-RI and thereby inhibits the binding of ligand. From this we conclude that E2-induced DNA synthesis in MCF-7 cells is dependent on IGF-RI signaling. Our results indicate that the E2-responsive strains, MCF-7 ATCC and MCF-7 NKI, autonomously activate their IGF-IR, and that this activation is required for their response to E2. Since endogenous production of growth factors is a common feature of many tumor cells, we investigated whether the two E2-responsive MCF-7 strains secrete an autocrine factor capable of activating their IGF-RI. We demonstrated that E2-insensitive cells become E2-sensitive when challenged with conditioned medium of E2-sensitive cells. This suggests that E2-sensitive cells secrete an autocrine factor capable of activating the IGF-RI. Differences in the levels of production of IGF-IR agonists by the breast cancer cells may explain the differences observed in the E2-sensitivity of the three MCF-7 strains. Van der Burg et al., using a sensitive bioassay, could not detect any IGF-I or -II production in MCF-7S cells . Other reports indicate expression of IGFs by certain MCF-7 strains. The majority of reports studying this issue report the absence of detectable IGF-I expression in MCF-7 [22, 23]. Expression of IGF-II mRNA has been detected by Northern blot analysis and RNase protection assays [24, 25]. After removal of the binding proteins, concentrations between 4.7 and 14.4 ng/ml per 107 MCF-7 cells of IGF-II protein has been found in conditioned medium depending on the technique used (RIA and radioreceptor assays) . Significantly, Yee et al. observed that IGF-II expression by MCF-7 cells increases with the passage number of the cell culture . This observation suggests that the factor secreted by E2-sensitive cells may be IGF-II. IGF-II has been shown to induce a mitogenic response in a variety of breast cancer cell lines. It has been found to be slightly less potent than IGF-I, since 2–4 times higher concentrations IGF-II are needed for equal responses in a DNA synthesis assay [25, 26]. Even so, the concentrations reportedly present in the conditioned medium of MCF-7 cells  are sufficient to synergistically induce a mitogenic response in MCF-7 cells upon addition of E2. The reason for the change in IGF-II expression over time is not clear. The MCF-7 cell line was isolated from a pleural effusion derived from a breast carcinoma , and was shown to consist of several different subpopulations of cells . It is plausible that during cultivation of the initially heterogeneous cell line an IGF-II-expressing cell type is naturally selected because of its growth advantage over non-growth-factor expressing cells. MCF-7S cells, in contrast to other laboratory MCF-7 strains, are almost completely growth arrested in G0/G1 phase of the cell cycle by serum deprivation in estrogen-free medium, without the need for estrogen antagonists or other inhibitors to reach quiescence. We have found that the MCF-7S cells show this characteristic for about 25 to 30 passages, after which the cells start to grow more rapidly and do no longer show complete growth arrest upon serum withdrawal. Furthermore, during cell culture the cells become more IGF independent and significant proliferation can be induced by the sole addition of E2 to the serum-free medium. Endogenous expression of IGF-I or IGF-II by E2-sensitive MCF-7 strains could account for their observed E2 inducible growth, independent of IGF-I addition. The change in E2-responsiveness of MCF-7S may indicate that prolonged growth in tissue culture triggers the production of IGF. Alternatively, IGF-producing cells that were already present in the original culture gain a growth advantage and gradually overgrow the non-IGF-producing cells. In conclusion, the differential response of different MCF-7 strains to E2 and IGF-I may well be due to differences in the individual IGF-expression status in these strains. Using RT-PCR, we found than none of the MCF-7 strains produce IGF-I. However, in all three of the cell lines IGF-II mRNA could be detected (data not shown). Thus, IGF-II may well be the autocrine factor involved in regulation of the response to E2. In conclusion, we have shown that E2-responsiveness of MCF-7 cells is dependent on the secretion of an autocrine factor activating the IGF-IR. All three strains of MCF-7 breast cancer cells investigated do not respond to E2 if the IGF-RI-pathway is blocked. Generally, breast cancer therapy is targeted at inhibiting estrogen action. This study suggests that inhibition of IGF-action in combination with anti-estrogen-treatment may provide a more effective way in treatment or even prevention of breast cancer. Anti-p21CIP1/WAF1 (H-164) was purchased from Santa Cruz Biotechnology (Santa Cruz, CA). IGF-I was from GroPep (Adelaide, Australia). Aprotinin, E2, sodium selenite, suramin, and TPA were purchased from Sigma (St. Louis, MO). Albumin, bovine fraction V (BSA, Catalogue number 840533), Na3VO4 and transferrin were from ICN Biomedicals, Inc. (Aurora, OH). The αIR3 antibody was a kind gift of Dr. S. van Buul-Offers from the Department of Pediatric Endocrinology, UMC Utrecht, The Netherlands. The MCF-7 human breast cancer cell lines were cultured in Dulbecco's Minimal Essential Medium/Ham's F12 medium (1:1), supplemented with 10% fetal calf serum, 300 μg/ml of glutamine, 100 IU/ml of penicillin and 100 μg/ml of streptomycin. Cell cultures of 40–60% confluence were used for experiments. Prior to experiments, MCF-7 cells were cultured for 24 h in phenol red-free medium containing 5% dextran-coated charcoal-treated serum, followed by an incubation in phenol red-free, serum-free medium, supplemented with 0.2% bovine serum albumin (BSA), 10 μg/ml of transferrin and 30 nM sodium selenite for at least 24 h.
Assays were performed in 24-well plates. Serum-starved cells were stimulated with IGF-I, E2, or a combination of the two and after 24 h of incubation 3H-labeled thymidine (2 μCi/ml) was added. 30 h after the addition of the stimuli, cells were fixed with 10% trichloroacetic acid, washed in PBS and lysed in 0.1 M NaOH, followed by liquid scintillation counting. Experiments were performed in 6-well plates. After stimulation, cells were washed with ice-cold PBS and lysed in lysis buffer (50 mM Tris-HCl, pH 6.8, 2% SDS, 10% glycerol). Lysates were boiled for 5 min and protein concentrations were determined using the BCA protein assay (Pierce, Rockford, IL). After addition of 0.1% bromophenol blue and 5% β-mercaptoethanol to the samples, equal amounts of protein (5–50 μg) were size-separated on a SDS-polyacrylamide gel and transferred to nitrocellulose. The membrane was stained with Ponceau S (Sigma) to check for equal loading and blocked with 2–3% non-fat milk or 0.5–2% BSA in TBST (150 mM NaCl, 10 mM Tris-HCl pH 8.0, 0.2% Tween 20) for 1 h. Incubation with the primary antibody was performed overnight at 4°C in 0.1 × blocking solution. The membrane was washed in TBST and exposed to horseradish peroxidase-coupled secondary antibody for 1 h in TBST. For detection the Western Blot Chemiluminescence Reagent Plus system (NEN Life Science Products Inc., Boston, MA) was used. We would like to thank Dr. S van Buul-Offers for the kind gift of αIR3 anti-IGF-RI antibody, and B. Hendriks-Stegeman and Dr. M. Jansen for helpful discussions. This work was supported by the Dutch Cancer Foundation, KWF, Grant UU 98-1701. IH carried out the Western blots, the DNA synthesis assays and drafted the article. RvS participated in the DNA synthesis assays. JS and PH participated in the design and coordination of the study. All authors have read and approved of the final manuscript.